Briefly, It has its origin in Malaysia, Indonesia, China and India. Many claim that there is no such thing as Singapore food for that reason. They are only partially right. You’ll still find the most authentic and tastiest of each of the cuisines. What has been happening to the various cuisines since their first arrival a century or so ago is what we now proudly call Singapore Food. For those of you who’re accustomed to "Wine and Dine", Singapore has a wide variety of fine restaurants to choose from, much like many other cosmopolitan cities. There is no shortage of publicity in that area so I shall not dwell upon that. To most Singaporeans, however, what Makan entails is not the quality of the service nor the presentation of the food, but very simply the quality of the food, the spontaneity, the cosiness, the convenience and most importantly, the affordability. In other words, it’s good company and a bit of sweat and noise thrown in without hurting the wallet. It’s a hot plate of Char Kway Teow after a half an hour wait in a hawker centre amidst all the screaming and shouting in the middle of the afternoon when even gold fishes find themselves hot in the bowl! Many Westerns Simply Cannot Resist Singapore Food. After You Have Eaten Singapore Foods, it is as if you have eaten all the famous food throughout Asia Countries. Roti Prata – Crispy pan fried "pancakes" made from wheat flour, water and butter (or ghee). Accompanied by fish or chicken curry. A common dish eaten as breakfast or supper. Number 1 dish loved by all Singaporeans! Hainanese Chicken Rice – The chicken is usually served with sesame oil, soya sauce and spring onions. If you are lucky, some hawkers will serve the chicken, deboned. The rice is cooked with pandan leave, garlic and the broth that is used to cooked the chicken. This increase the aroma of the rice. The rice should look shiny (because of the chicken fats from broth) and a slight tinge of yellow. You should be able to taste chicken with every mouthful of rice. Nasi Lemak – Coconut-flavored Rice Meal – is rice cooked in coconut milk made aromatic with pandan leaves [screwpine leaves]. It is typically served with Sambal Ikan Bilis – fried dried anchovies cooked in a dry sambal sauce, and garnished with cucumber slices, hard boiled egg and roasted peanuts. 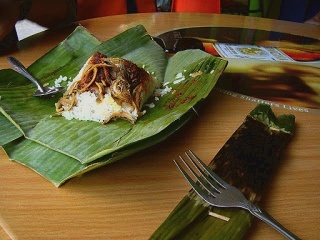 Traditionally packaged in a banana leaf, it is usually eaten as hearty breakfast fare. 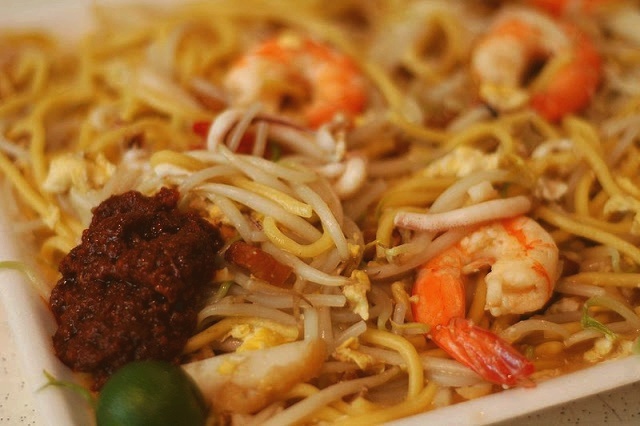 Hokkien Mee – For visitors to Singapore, you must eat this Hokkien Mee mixed with the sambal chilli and lime juice. Each servings will come with a small lime that is cut at one end. To make this better eating experience, you may want to squeeze the lime juice into your spoon first, remove the lime seeds and then pour it into your Hokkien Mee. The lime juice can remove the oily feeling of Hokkien Mee. Satay – Stick-skewered (kebab) marinated meat strips barbequed over a charcoal fire grill. The meat used is usually beef, mutton and chicken. Adam Road Food Center This hawker center was recently upgraded. With a new facade and more parking space, it is very popular with lunch time crowds. 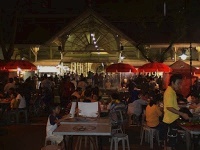 More than 50% of the stalls serve Malay or Indian food. Good Nasi Goreng, Roti Prata, western food can be found here. Do not miss the BBQ seafood and the famous Nasi Lemak stall. Location: Junction of Dunearn Road and Adam Road. Lau Pa Sat is the largest remaining Victorian filigree cast-iron structure in Southeast Asia. Located in the heart of Singapore’s business district, it is a favorite meeting place of the locals. Built in 1894, Lau Pa Sat was a wet market and has now been restored and converted into a food centre offering a wide variety of local food.Location: Boon Tat Street, Shenton Way, Robinson Road.